Now don’t get us wrong, we’re not advocating bank robbery as an easy way to resolve your financial difficulties. 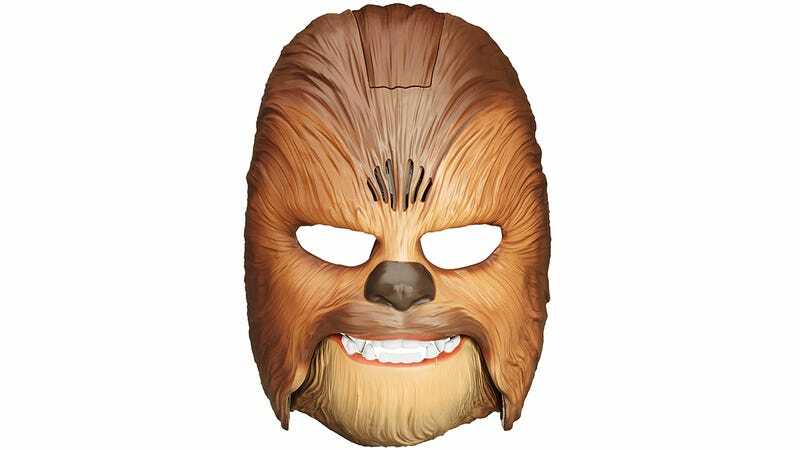 We’re just really looking forward to the first security camera footage of a perp using this electronic Chewbacca mask to hide their identity behind authentic Wookiee roars. Available now for 30 well-spent dollars, this battery-powered mask triggers a roar sound effect whenever the wearer opens their mouth—and with varying degrees of intensity. The wider Chewie’s mouth is opened, the louder and fiercer the Wookiee roar will be. Disguise your voice like the dark warrior villain from Star Wars: The Force Awakens and battle against the Resistance! Press the voice changer button and give commands to your First Order troops. The button activates voice-changing technology for several seconds, allowing hands-free play! Requires three AA batteries, included. Return to a galaxy far, far away with a new and improved DARTH VADER VOICE CHANGER HELMET for 2015! Kids can pretend to rule the galaxy and command their legions in the voice of the evil SITH LORD. The helmet uses state-of-the-art electronics to alter the user’s voice to sound like DARTH VADER and also plays signature DARTH VADER movie phrases and breathing sound effects to add to the adventure. Requires three AA batteries, included.